Very entertaining commentary on this book. I have never read Grey. I know people who love him. It really does not sound like it has many redeeming qualities. I think that I saw the 1941 film version of this. Grey and Louis L'Amour were both very popular in the ranch town where I spent my teenage years, Brian, so I at least used to know a lot of people who loved them as well. Don't understand the love for this hamfisted and very poorly-written book although I may be underestimating Grey's storytelling skills as aspects of the plot appealed to me as cheesy entertainment despite the howlers and other flaws also in (constant) evidence. Anyway, thanks for the visit and comments! I occasionally wonder if I ought to read this book for (literary) historical thoroughness. Maybe I will, someday, but you remind me of why I have not. 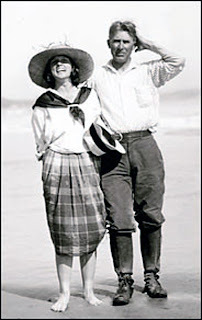 Just yesterday I read a Robert E. Howard Conan story, which I had never done before, so it is not like this is beneath me. But at least Howard is only prejudiced against, I don't know, Atlanteans or anyways peoples who do not exist. I thought Grey might be good at landscape descriptions at least, but he really wasn't at all or at least not here. Writing quality-wise, think H. Rider Haggard or Horatio Alger with horses. Thanks for the laugh about the Conan story, by the way. Damn Atlanteans! Always glad to help, Dorian, even if it means taking one for the team. Ouch! Seems like you did! I hope you are reading something better now. I had wondered about that novel for a while and it wasn't all bad, so I'm not totally upset that I read it. Still, I'm happy to be moving on to happier reading pastures for sure! Good to see you posting, Richard, even if on a book the chief appeal of which appears to be its memorable title! I'm disappointed to learn that any evocative landscape description might stop there. My spouse, fascinated by all things Western, particularly Native American cultures, recently picked this up along with several other Zane Gray novels, but she has yet to read any. I eagerly await her expletives. Thanks, Scott. I guess it's kind of ironic that of all the good stuff I read during my blogging hiatus, it was this extremely uneven title that welcomed me back so to speak! Anyway, hope your wife has better luck with Riders and/or her other Greys than I did. I don't know if it's exactly a positive or not, but I did feel more empathy for Grey's equine and canine characters than his human ones. Maybe that was a hidden "strength" of his, ha ha. Cheers! I enjoyed the descriptions of this one. I thought it was cinematographic. I didn't expect anything subtle or accurate, just something that fit the genre. I wasn't disappointed. But I guess you're rarely disappointed when you don't expect much. Glad you enjoyed this one more than I did, Emma, and I should admit that there were one or two descriptive passages that I fancied even if on the whole I didn't find it "cinematographic" at all myself--wish I had! Quality-wise, I'm not sure how representative Riders is--I've seen dozens of westerns but read almost none. This one was educational for me in a sense even though I didn't exactly appreciate the lesson. Cheers! 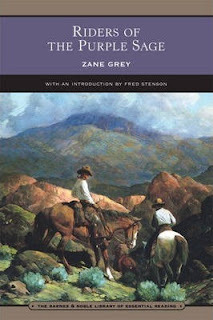 I've also read this, and rather liked it but not enough to ever read any more Zane Grey. It's pulp fiction and I think has to be read as such. Characters will never be more than functional. Re Robert E. Howard, much as I love his Conan stories I'm afraid some of them (possibly just one actually) are pretty explicitly racist. He's an important and effective writer, but of his period. Unlike HP Lovecraft, whom I love but who was considered deeply racist even by the standards of his period. Pulp for me is about pace, plot and cinematography (I wish I could have had a third p there). In terms of westerns with more literary qualities, News of The World by Paulette Jiles isn't bad. There's a review at mine for those interested. Belated thanks for your comment and for the tip on the Paulette Jiles novel, Max. I guess I've just had better luck (and more experience) with pulp detective stories because this novel underwhelmed me in ways that I really couldn't attribute to genre failings. That being said, I'm glad to have heard from a couple of people now who have enjoyed Riders of the Purple Sage. Interesting to hear what worked for other people. Cheers! Sorry, that last comment was from Max Cairnduff - pechorinsjournal. For some reason it came up as anonymous.